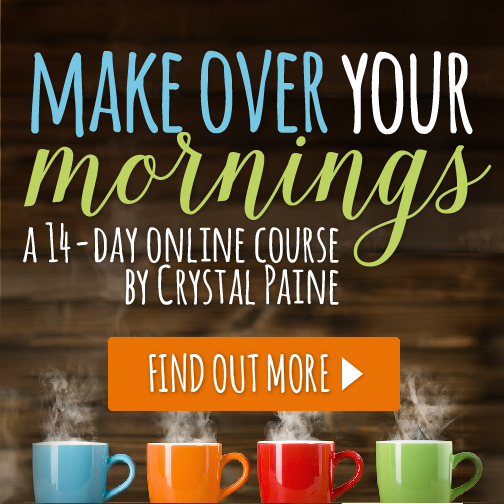 A couple of weeks ago, I shared that I would be starting an online course called Make over Your Mornings. I’m on Day 6 and it’s been really good! I’ve learned a few things about myself and have solidified some goals I have. Day 1 – Why Make Over My Morning? Because I want to start my day off in a way that helps me and my family feel ready for the day. Day 2 – The Night Before – We have ACTUALLY been packing lunches at night and it’s made our mornings a lot better! Day 3 – Big Rocks – I know my priorities – Marriage, Motherhood, Ministry, Money, Me (the things I blog about), but talking to Racer about them and hearing his input was encouraging! Day 4 – Incentive – Wanting a good cup of coffee isn’t a bad thing! It was difficult to think about what MY external and internal incentives are. This day was hard. Day 5 – Breaking Down Goals – I’ve done goal setting before. Many times. And follow through is usually lacking. My goals are not too big, but I’ve never had a “routine” to put them into. So I hope this step-by-step thinking will help. Day 6 – Bit-Sized Pieces – I need to think more on today. Breaking my goals into small actionable steps should be easy, but I struggled with this step too. The workbook included a great goal-setting sheet, so I’ll print extras of these out and work on them some more. Again, I’m really enjoying the Make Over Your Mornings course and look forward to starting Make Over Your Evenings next. I’m still struggling with getting up earlier, but I have been going to bed pretty consistently (and earlier than usual), so I hope my body is readjusting. There have also been challenges along the way. Late night activities. Sleeping through the alarm. Buying coffee beans instead of ground coffee (yeah… 2 days without my “incentive” to get up with the alarm!). And mountains of laundry that had yet to be folded and put away (which means digging for school uniforms). But that’s why I need a better routine. Things will still happen. Kids will still be crabby. Last minute things will still need to be located. BUT, a good routine will help to lessen the rush and will give me morning margin to deal with the real emergencies and morning grouchies with grace. How about you? How do you deal with morning madness with grace? It was another piece of paper. Another thing to put on the calendar. Something else to schedule. But Girlie was so excited to hand me that paper with those words at the top. The invitation sat on the counter for a couple of days. “Mommy, did you get this in your planner yet?” “Not yet, let me put it in there right now.” I slipped it into the front pouch to add it to the calendar page later. I had forgotten. We were invited and I had forgotten. Forgotten the importance of this invitation for my Girlie. Forgotten that I had said I would go. Forgotten all about the invitation. So a quick shower and new outfit later and I was presentable and ready. Off to school drop off and the Honor Roll Breakfast. When the students walked in, she looked for me. She wanted to make sure I was there. I took the picture, hugged her when it was all over and went off to the rest of my morning. Although I had forgotten, the invitation was still there. Although I had forgotten, Girlie was still living with my promise. Although I had forgotten, space was made for me to remember and be present and live into my promise. Parenting is distracting work. We juggle a variety of needs and questions and assumptions and chores and invitations. As I’m learning to give a best yes, I am continually balancing self, husband, children, friends, ministry. Today, I almost blew it. I almost missed a best yes. And you are invited too. Each of us are invited to live into the promises made by God, the good father. And when we forget about that standing invitation, we get reminders that the invitation still stands. Even after we have forgotten. Even after we have left our Bible sit, tucked away and unread for however long. Even after we ignore the small reminders. But grace enters in and space is made for us to remember and be present in a life of love and to live into the promises of God. Will you accept the invitation today? We used to belong to a gym. Yep, you heard that right. Used to. We had a family membership to the local Y. For a time, we went regularly, particularly the kids and I. But then life got busier, time got more occupied and the Y was less frequented. So, in an effort to save money and use our resources to pay off some debt (at the time), we didn’t renew our membership. And my body has paid for it. You see, for every financial decision we make, there are good and bad consequences. No consumer debt = good. No exercise = bad. When we were members at the gym, I at least tried to go and “get my money out of it.” Tried. But then, I just didn’t. Now, Racer and I have talked about needing to re-join the Y. But I’m having a hard time justifying the money for a family membership when we still are trying to build our emergency fund. We have other financial goals that those fees would go toward. But in a physical earlier this year, my doctor and I agreed that I need to move my body. While my health “numbers” are ok, the direction of my health is going the wrong way. So, save money or go to the gym? The answer really came to me in stages. Walking was a good start. Then my health insurance sent home pedometers with a cash earning program for reaching certain step goals. Then a morning devotion focused on the theme of “move” really hit my heart. Yes! But if I am wonderfully made, how is my physical state living that out? Am I honoring God’s careful creation of me? I want to do that, thus I need to care for my physical self. So, then the wrestle comes. How do I manage my money, my time and my physical self in a way that is pleasing to God and still keeps me on track for the goals our family has? How do I balance the need for exercise with the need to save money? You see, it’s not just the gym membership that costs, but it’s also the gas to drive there as there is no location that is convenient. So how do I find something low-cost, that fits into my schedule and is convenient. I mean, why can’t I have it all? Well, God helped. Just a week later, in my morning devotion, the theme was “walking.” Walking with God, walking God’s path for me in life, walking in God’s presence. So, I’m walking. Walking with friends. Walking in the morning on the days I drop kids off at school. Walking. And while I walk, I have my ear buds in, listening to Dave Ramsey’s podcast and True Stewardship podcast (and a few others) so that I can also stay motivated on my financial journey! Win win right?! I also found a couple of free apps that lead me through a bodyweight style circuit. You know, push ups, jumping jacks, lunges… that type of thing. Totally free and does all the timing and instructions for me. So that’s good too. So, gym membership money gets to stay reallocated to savings goals AND I’ve found a way to get in free exercise. And for accountability, I text my dear friend for encouragement. You may have a conflict in goals – money vs. ?? Maybe its money vs. quality time with your spouse. Maybe it’s money vs. “making memories” with your children. Maybe it’s money vs. a need for relaxation. Each decision we make has consequences. Perhaps, though, there is another way. Perhaps, there is a way to do both. Maybe not how you imagined, but still a way. Think creatively. Think outside the “normal” box. Ask God for help. It may come in pieces, but it will come. I’d love your encouragement and ideas for other “free” ways to exercise! Please share your struggle, journey or thoughts in the comments below. Also, remember to sign-up to join me for a morning make-over (affiliate link) starting May 1st!